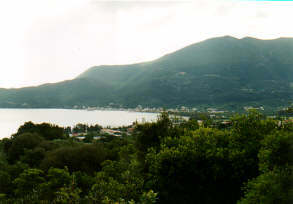 On Kefalonia, Sami isn't one of the most stunning places to visit. However, around Sami, especially if you came here for walking, there are many things to enjoy. Sami has quite a history, and walking is about the only way to discover all the interesting places. You could have guessed, there's at least one place inside the city limits that's quite interesting anyway: the harbor. 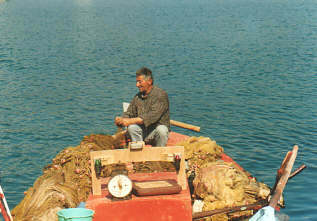 One day, we sat here on a bench for more than half an hour, just looking at the fishermen. In the area around Sami there are many deserted villages that were destroyed in the earthquake of 1953. 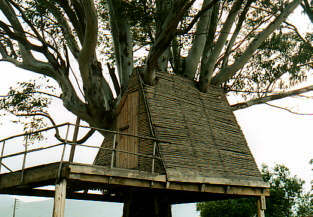 The Danes helped the people here, they built wooden houses just like you can find in Denmark. Because the climate here is not too bad, some of the wooden houses are still used, and they look in perfect state. After the earthquake a lot of farmers and shepherds who used to live here, went to live at the shore, finding other work. The landscape changed completely. A lot of land which is now covered with woods used to be farmland. 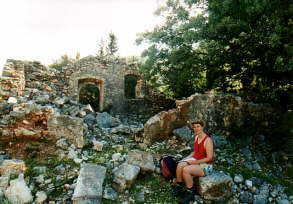 To the east of Sami are also ruins. These are of the historic city and of the city wall. The city wall used to be almost 10 meters high, at the moment it is still several meters in height. The wall is built 2300 years ago, a real piece of mastership, considering the height of the wall and the steepness of the mountains on which it is built. And large parts of it survived 23 centuries of small and strong earthquakes. The best beach around Sami is Antisamos beach. We made a walk from Sami to the beach. 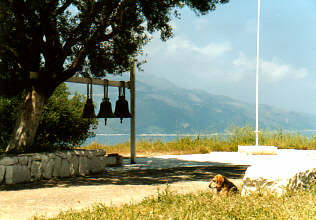 At the highest point of the road to the beach, there is a small footpath that leads to the Dichalia lighthouse. 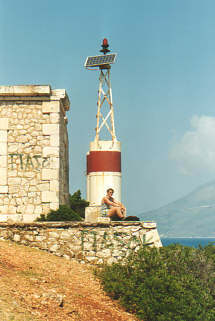 This lighthouse (actually it is just a navigation light) is the best place on Kefalonia if you want to see dolphins. Especially in winter and spring, the dolphins are supposed to swim into Sami Bay. Of course, the day we picked to see dolphins proved to be their day off. But we didn't mind, it was a great place to sit and to look at the boats in the sea between Kefalonia and Ithaca. 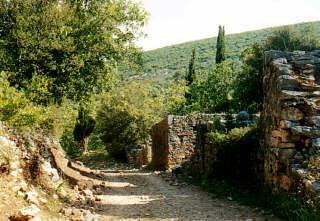 On our way back from Antisamos beach, we decided to make a detour to see the Agrilion Monastery. You can't have been in Greece and have not seen a monastery. At Agrilion, the monks didn't show themselves (siesta-time). Even this very lazy "guard" dog wasn't the least interested in us, until we thought it was time to have a cookie break. Yum, cookies, can I have one too ? We think the children in Sami have very sophisticated ideas about making tree huts. And, the children are not as lazy as the dogs.